Flying home for the holidays? 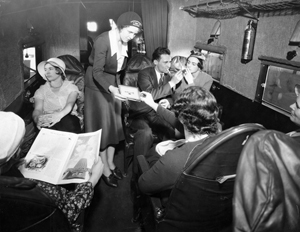 How things have changed since 1934, as captured in this view of an Eastern Air Transport airliner. The Curtis Condor, an 18 passenger aircraft, was the first commercial aircraft to utilize autopilot. Originally designed as a bomber for the U.S. Army, a commercial version was in operation for a short period in the early 1930s before being replaced by the famous Douglas DC series airliners. Source: Manufacturers Aircraft Association Collection, Box 670, Folder 7, American Heritage Center, University of Wyoming. Click here to view a full size version of the image. The Photo of the Month is a new monthly featured post intended to showcase distinctive images from the AHC’s collections. Subscribe to this blog so you don’t miss one! If you want to see more of the Center’s digitized photos, click here! This entry was posted in aviation history, photo of the month, resources. Bookmark the permalink.